blanch onion in a 1 1/2 quart saucepan of boiling water for 1 minute: drain. Return onion to pan, add vinegar, water, and salt, and bring back to a boil. Reduce heat and simmer, stirring occasionally, for 1 minute. Transfer mixture to a heatproof bowl. Cool, uncovered, then refrigerate until cold, covered, about 2 hours. blend chipotle and mayonnaise in a blender of food processor until smooth. 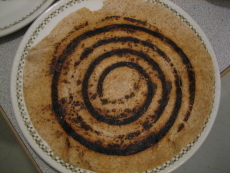 Toast tortillas directly on (gas or electric) burners over moderate heat, turning over and rotating until slightly puffed and browned in spots, 40 to 60 seconds. Spread 1 tablespoon chipotle mayonnaise on each tortilla. Arrange one quarter of turkey and pea shoots across middle of each tortilla and top with some drained pickled onion. Season with salt and pepper and roll up wraps. I cooked this a while ago, and by happenstance I’m getting to writing it up just before the Americans have their turkey day. If any of you are planning a big turkey feast for thanksgiving this is a wonderful way to use up some of the leftovers. My post Thanksgiving sandwich is a fairly ritualized affair, it must have a mix of white and dark meat, mayo, cranberry sauce, rice and sausage stuffing, and a bit of lettuce, preferably on fresh sliced multi-grain bread, or baguette. But for a post-post thanksgiving sandwich, I think this wrap is the way to go. Its components are just a little different, and very versatile. The pickled onions were shockingly good. It didn’t seem like they’d be anything special, just some blanched onions with vinegar and salt, but the onions are transformed. The harsh raw onion flavor is mellowed and replaced with the sweet-tart cider vinegar. They lose that mouth-stinging halitosis-causing raw onion edge, but retain their raw flavour, and even have it enhanced by the salt. These picked onions are beautiful too, the red pigment dissolves in the vinegar and dyes them pink. We loved them on these sandwiches, and then we put them on everything else we could think of ’till we ran out. Just writing this makes me want to go whip up another batch. The chipotle mayonnaise was also a winner. There’s nothing to it, just chipotles in adobo and mayo, but it’s a super versatile topping for pretty much any sandwich. This mayo is so simple, and so good, that I’ve elevated it to the status of fridge staple. While these wraps are an ideal way to use up a whole roast turkey, you don’t have to limit them to the day after major feasts. I can find turkey breasts at the grocery store pretty frequently these days, and I love them. They’re lean, inexpensive, and more flavorful than chicken breasts. I seasoned the breast with salt and pepper and then grilled it using the same indirect heat technique I used for the Cornish hens. When cooking a whole turkey the breast tends to dry out by the time the thigh is done, but if you’re just grilling a breast you can take it off as soon as it hits 170 F. I did a much better job on this breast than on the Cornish hens. The skin was golden, crisp, and packed with flavour, and the meat was wonderfully moist. The elements of this sandwich are really strong, and they compliment each other well when combined. Sandwiches are about as humble as food gets, but when some real though it put into their composition they can be a treat. My only real criticism of this sandwich is the recommendation to grill the tortilla over a gas or electric burner. I was pretty skeptical about this working on my electric stove, and guess what? it didn’t. I wonder if they tested this on a gas stove and figured it would work out for electric too? or perhaps I’m missing something. My dining companion just shook her head and sighed while she watched me fill our kitchen with smoke. 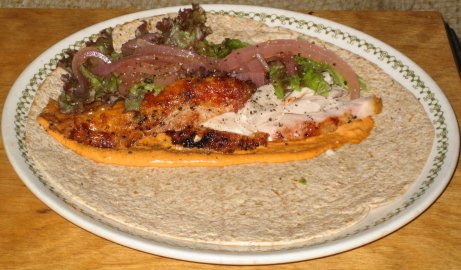 This was a very simple wrap, but everything about it was delicious. I saw this recipe coming up in my backlog, and decided I had to have it again. So, last night made a variation with grilled chicken, and I added bacon. I didn’t recreate the wonderful pickled onions and I regret that. This wrap is nothing fancy, but it earned its five mushroom rating. Hmm, I think I’m actually tempted to make these… or rather have my dining companion make them for me. It’s like your own personal restaurant. My aunt, a gourmet southern cook, made these for us the day after Thanksgiving last year. They were fabulous! Will be making this year, and probably every year after that, in our home. Superb recipe! Wonderful! What I wouldn’t give for a gifted southern cook in the family.